Our finely crafted 9 day Mont Blanc program takes a unique approach, using our classic Alpine Ascents style to guiding this highest peak in the Alps. With extra days for summit and training we greatly increase traditional success with ready climbers and a chance to combat fickle weather. All teams start with an ascent Grand Paradiso (the highest peak in Italy), allowing for increased acclimatizing while also offering a chance for the climber to see a different area of the Alps. These details truly make the difference not only in possible summit success but in providing and superb overall climbing experience. Our inclusive 9 day programs utilizes an excellent a 3 star hotel before and after the climbing portion of the trip. 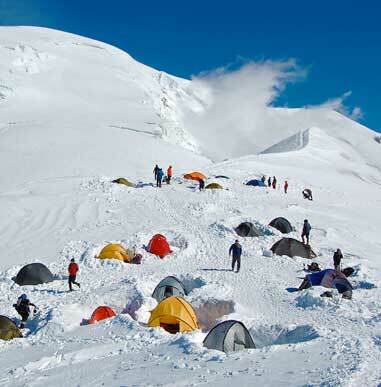 Many of our competitors do not include all costs and use a short 8 day expedition with only 6 days of climbing. 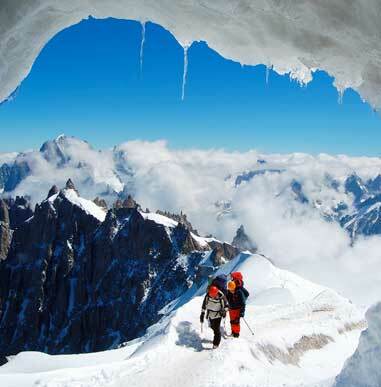 Alpine Ascents provides a one-of-a-kind experience climbing Mont Blanc, as our guides are highly trained and all are certified by the American Mountain Guides Association in skiing, rock climbing, and alpine climbing. Guides have experience working all over the globe, but typically they spend the majority of the season working in the Alps, which ensures they are up to date on mountain conditions and weather. We have been running Alps trips since 2010 and are the only American company with an all-inclusive trip so that you don’t have to worry about booking your hotels, huts, and tram fees. The nature of the Alps allows for maximum flexibility, so if conditions are not suited for our intended objective, we have many options to experience a different summit or area of the Alps. As the highest peak in Western Europe, Mont Blanc is perhaps the most famed ascent in the Alps, and is considered the birthplace of climbing. First climbed in 1786, Mont Blanc maintains the same allure today, given the peak’s stunning beauty, pristine villages, and its prominence as the Alps’ high point. The peak has relatively easy access due to the trams and lifts that begin in the Chamonix valley. Alpine Ascents provides training and acclimatizing prior to our summit attempt on Mont Blanc. This Mont Blanc climb is challenging, and requires climbers to be in excellent physical condition. Please review the training statement for this climb, as new climbers often have difficulty assessing the true demands of the ascent. Prior use of crampons or glacier travel is helpful but not required. Prior glacier experience may include climbs of Mt. Rainier, Mt. Baker, Mt. Whitney, or similar peaks. 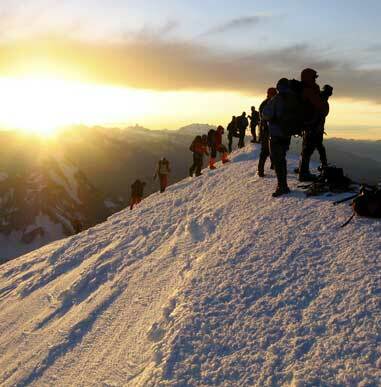 Please note that most climbers do well on Mont Blanc as a first climbing endeavor, but climbers must successfully complete the basic competency (fitness and skills) on the first three days in order to ascend Mont Blanc on the following days. We place this caveat as a matter of safety. Ultimately, the mountain will challenge even the most fit climbers and it is only prudent to show up in tip-top physical condition. Our overall success rate on climbing Mont Blanc is near 80%. Climbers are typically challenged by the physical nature of the climb. Weather and objective hazards are also a consideration when planning our summit bid, and sometimes we will attempt another 4,000-m peak when conditions on the Mont Blanc are suboptimal. Climbers find these alternate objectives equally challenging and rewarding. Our Alps program director, Jonathon Spitzer, made some itinerary and logistical improvements in our continued efforts to fine-tune our program. In 2014, we had 15 climbers reach the summit of Mont Blanc and we look forward to improving conditions in the 2016 season. We begin our Mont Blanc climb in beautiful Chamonix, meeting at the hotel in the evening for a group dinner. The following morning our guides complete a full, detailed gear check after our morning breakfast and then we head up to the Aiguilles Rouges for some alpine rock and snow climbing training. The first recorded ascent of Mont Blanc was on August 8, 1786 by Jacques Balmat and Michel Paccard. Nearby, Chamonix hosted the first Winter Olympics in 1924. In 1965, the 7.25-mile long tunnel that goes under the Mont Blanc Massif was completed. This tunnel connects Italy with France and is a major transportation route in the Alps. We begin our Mont Blanc program by climbing the Crouches traverse and the 4,061-m Gran Paradiso. The Crouches traverse is the perfect objective for our first climbing day because it provides climbers with a chance to practice alpine rock and snow climbing skills. Plus, it is a relatively short day and allows us to work off the jet-lag haze in a beautiful but not entirely committing setting. On Day 4 of the trip, we will head to the Gran Paradiso in Italy via private taxi. The Gran Paradiso is the tallest peak in Italy and a great introduction to mountaineering in the Alps. We will spend two nights in the beautiful Chabod mountain hut where they serve delicious Italian cuisine. The hut is located at 9,022 ft. and offers climbers a great chance to acclimatize to higher elevations. Learning and reviewing skills is the major goal during this portion of the trip. During our summit attempt, our guides will continue to offer coaching as it relates to cramponing, ice axe use, and glacier travel. Our summit day often takes around 8–10 hours round-trip from the hut and provides our climbers with a chance to test out their skills and fitness on a 4,000-m peak. On our third day of the Gran Paradiso trip, we will descend back to town where we will refuel with gelato and Italian treats. Our goal is to be back in Chamonix by midday so that we have plenty of time to rest and recover and get ready for the Mont Blanc portion of the climb. Rested from our night in Chamonix, we begin our Mont Blanc ascent by boarding the Bellevue Tram and the Mont Blanc tramway car to 7,800 ft. We then travel by trail to the Tete Rouse Hut at 10,400 ft., where we enjoy an early dinner before going to bed. We wake for an alpine start on our ascent of Mont Blanc by a traverse across the Grand Couloir. Once on the other side of the couloir, we will encounter some moderate and steep scrambling over rocks to reach the Gouter Hut (12,500 ft.). At the Gouter Hut we will be able to take a nice break inside before continuing towards the summit. From the Gouter Hut, the climbing route changes character and becomes a snow and glacier climb. After climbing for about two hours on snow with our crampons and ascending the Dome d’Gouter, we reach the famous Vallot emergency refuge at 14,400ft. From the Vallot, the climbing route follows a steep and stunning ridgeline until we reach the spectacular summit ridge of Mont Blanc at 15,782 ft. We attempt to reach the summit in the early morning, then retrace our route back to the Gouter Hut for a break. Then we descend to the Tete Rousse Hut where we will spend the night. The guides were both able to perform in the leadership role and would transition from one to the other seamlessly. In fact together they made a great pair of leaders – keeping us motivated, encouraged and pushing our limits (always with safety as the paramount consideration).